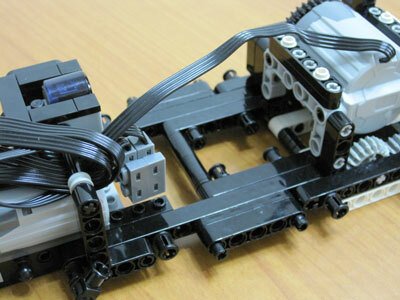 TechnicBRICKs: Week TechVideo, 2009 #36 - Snow White drives CRAZY! Week TechVideo, 2009 #36 - Snow White drives CRAZY! Snow White is a beauty! 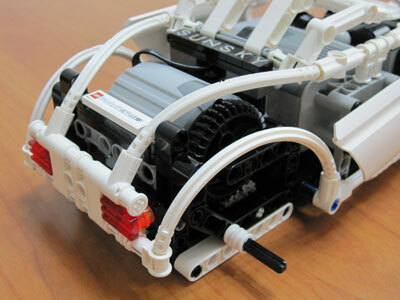 It is a race car built by Jaeho Jung (sunsky or sunmint1, depends wherever you find him) [1, 2, 3] for the "1st BrickInside Power Function Racing Contest" (The LEGO racing contest from one South Korean LUG). This Drift Parking video, should give you an idea how this machine is something special and much care was put on its construction (also those skills to park the car might be of use... ). An outdoor video from Jaeho Jung playing with his racer can be also seen below. 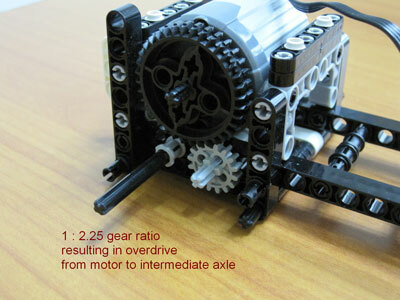 Gear Ratio for drive is 1:3.75 overdrive, and so the car is quite fast (about 2 m/sec on smooth surface). 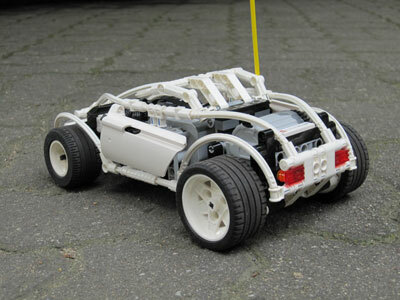 The car was intended fast for the contest but turned to be a bit difficult to maneuver sometimes into an obstacle course, because of its high-speed according to the author. 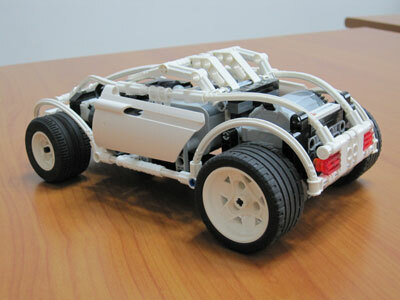 The car itself seems very well built in its modularity and having a good bunch of details for its size. 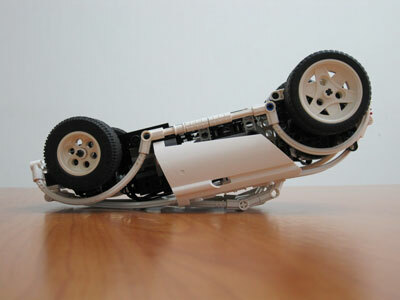 Smooth curves, the Racing look and its All White color, are also quite distinctive in this model. 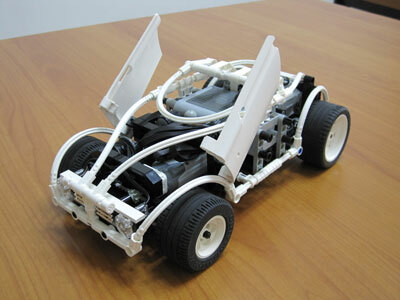 Jaeho Jung made an extensive and comprehensive review his car, at BrickInside Forum, which he had the courtesy to translate into English for all us being able to read (it's worth reading). Along with his review, he also added lots of photos that would allow you to understand all the details as well to build a copy if you like, or to get some ideas for your own. 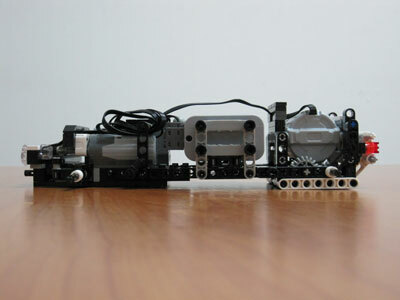 One XL-motor for the drive train and M-motor for steering. 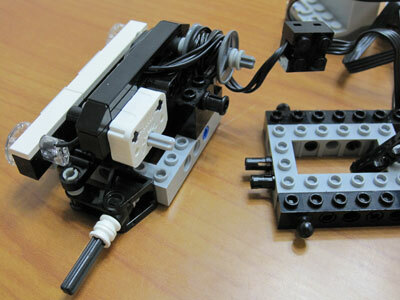 Versatile and easy custom driving module. Overall 1:3.75 gear ratio, resulting into overdrive and a too fast car, but different gear combinations (16t > 16t or 12t > 20t, instead of 20t > 12t in the right photo) can be easily applied to slow down the car and fit some different purposes. 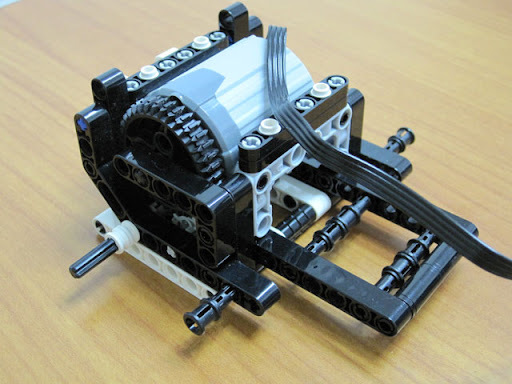 Return to center steering mechanism, inspired on Ian Power's idea. 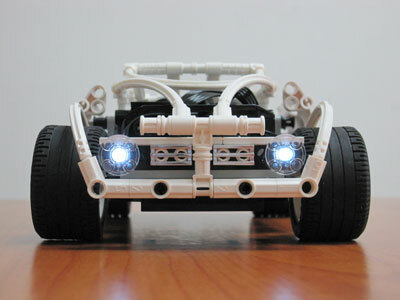 Working headlights, when battery switch is on. Ground clearance, about two studs (2L). 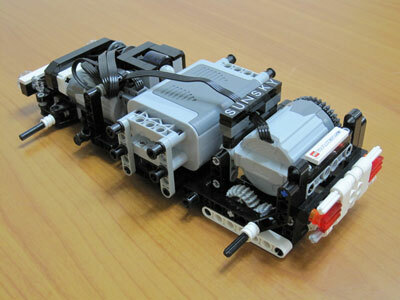 I loved the chassis construction, but also specially enjoyed the solution applied on the PF remote handle. An unexpected use for part 41667. 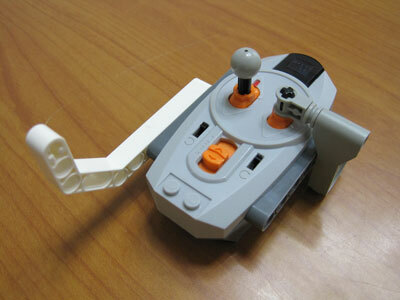 Also the the white liftarm position can be adjusted to the driver's age or hand size. Definitely must give it a try! "Within these limits, any form is possible such as a car, bike, tank, walker, or even a moving house" as from Jaeho Jung's own words. The contest included 3 categories: Racing, Design and Popularity and Snow White got 2nd on the Racing category. 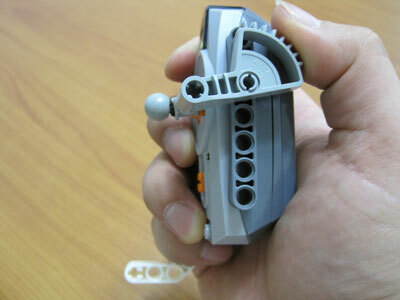 You may find a lot of photos from the contest at BrickInside forum [4, 5]. Very nice, love the all white colour shceme and the overall looks of the model. That parking was nice too! Wonder if there is any room for a differencial with some re-arranging of the layout. Must try and build something similar now haha! 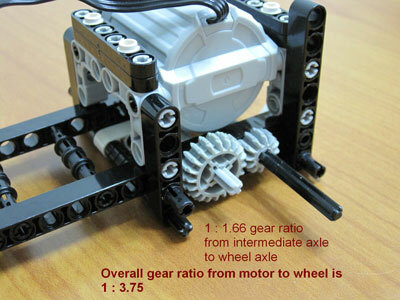 Its gear ratio is high also, and adjustable with different gear combination. Hi, this is Ashlee. Recently, I visited your blog and found some useful information in your blog. I hope my blog which provides BLOGS DIRECTORY information might be helpful. So, I request you to do the favour. Please place my blog link in ur blog roll and below is my blogs directory information Blogs Directory and I also invite you to review my blog at your convenience. That's really some wicked driving! I wonder how long you practised until you managed to do such a great marking manoeuvre? Also, did you get better handling with the differential? I'm not sure if in situations of drifting having no differential might be beneficial. I am not so good at(familiar with) web and blog things. What is Blogs Directory ? Is it kind of place for blog search ? Do you mean the Drift Parking? 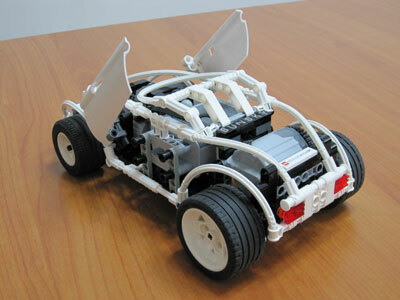 The car was (almost) completed in June but the Contest was in August. So, there were enough time to practice normal control(not drift). While driving in office floor, I was excited to find this car can drift and had fun playing with it. And then I thought about the drift parking. I also was curious about what enables the drift. At first, I thought NO-differential makes natural slip between rear wheels and it gives main reason for drift. 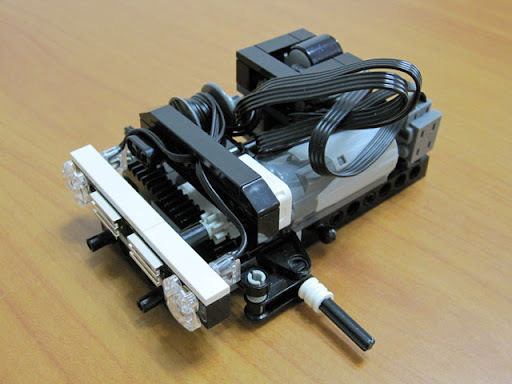 So for comparison, I made another driving module with differential gear. I posted it on my blog . 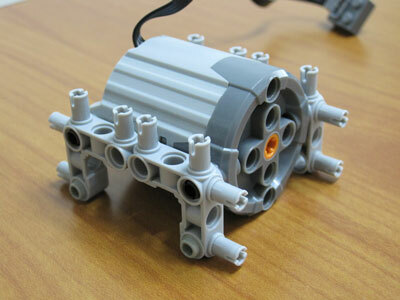 Differential module also performed easy drift. My conclusion is, the drift was possible because of the high speed. Differential is not a main factor as for drift. You can see a similar video of Sariel . Some aspects are different. The battery and driving motor are different from mine. But the fact that these cars have high rpm of rear wheel is the same and it is the main cause of, I think, drift. Any time a car goes too fast around a corner it will slide sideways out of control because the tyres do not have enough grip to change the cars direction of travel fast enough. Drifting is constantly keeping the car at the limit of control for a sustained period just after you've allowed the car to pass it. The differencial probably wouldn't make much difference, but the tyres might. Have you tried different tyres? Philos always useful site has some great info on tyres. I did not test other tyres. I agree the differential doesn't make much difference, but the surface condition does matter. On a surface with more friction, it is hard to make a drift or impossible as you see in the outdoor video. When getting some extra time, will update the post from 1st Sep. were the method was presented here at TBs.